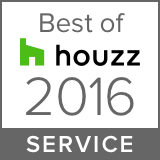 Joseph & Berry Remodel | Design Build were recognized as Best of Houzz Service Award for 2016. If you are looking to renovate your home, we invite you to look into our unique process. Click to learn more!